Celebrating their love through music. 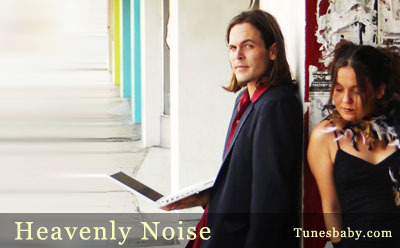 In an era where love songs have become tragic, Heavenly Noise is the dynamic duo celebrating their love through music. This husband and wife team, from Jacksonville, Florida, are an electro-acoustic soul act that pride themselves on defying genres. After taking a 6-month hiatus in China and playing around Seoul, they are now finishing up their second full-length recording, to be released on Melting Pot Music in 2006. Their debut album, Room For Two was a refreshing combination of r-n-b, soul, hip-hop, and jazz, even world music. Lead singer Daisey has a voice that's every bit as sultry as the best soul divas and, at times, as roaring and raspy as Janis Joplin. Her husband, producer/composer, Batsauce, is the essential one-man band. Crafting head bangin' beats, infectious hooks, and a vast array of sounds, he is able to lay out the sonic tapestry that makes their unique sound so complete. Together, they write the lyrics, inspired by their true love. It was destiny. Daisey and Batsauce met on stage four years ago. Batsauce was slingin' beats at an open mic jam and Lady Daisey took the mic. Shortly thereafter, the two became inseparable. They began chronicling their love through their music. These sonic confessions offer a rare glimpse at true love shared by anyone, much less shared between two musicians. Their recordings reflect the developments of their love, from courtship to marriage. Heavenly Noise is a breath of fresh air, and most exciting, is that it is true & sincere. Songs about love, life and the world we live in. Heavenly Noise's live shows are never the same twice. They always rock the party, but they often invite musicians, vocalists, and emcees to join them. Batsauce is a multi-instrumentalist and with the ever-rotating door of musical guests to draw from, you never know what a Heavenly Noise concert will present. Guaranteed, while head's nod, you'll see Daisey singing her heart out. And perhaps their trademark is their repoire between each other. It's rare to see love like this onstage or off. But under the glow of stage lights, it's their chemistry that becomes so glaringly obvious, providing inspiration to those in love or searching for it.